A refreshed brand identity to help an expanding franchise appeal to a diverse, global audience. Master Chef Katsuya Uechi’s internationally-renowned chain Katsuya needed a cohesive look and design strategy that was dynamic enough to incorporate new localities and universal enough to appeal to a worldwide audience. We worked with sbe Entertainment Group to develop a refreshed brand identity, aesthetic, and design guidelines that bring Katsuya’s founding principle of victory to life across all facets of the brand. Chef Katsuya’s Japanese kanji symbol stands for “victory,” a principle that guides the restaurant to continually strive for excellence. We began our explorations by defining the essential elements that ensure Katsuya’s continued victory—design, service, and cuisine. Each of these elements was assigned a brand persona — The Samurai (design), The Chef (cuisine), and The Geisha (service),. We assigned a unique pattern to each of our personas which we brought into photographic treatments, menus, packaging, and other collateral. 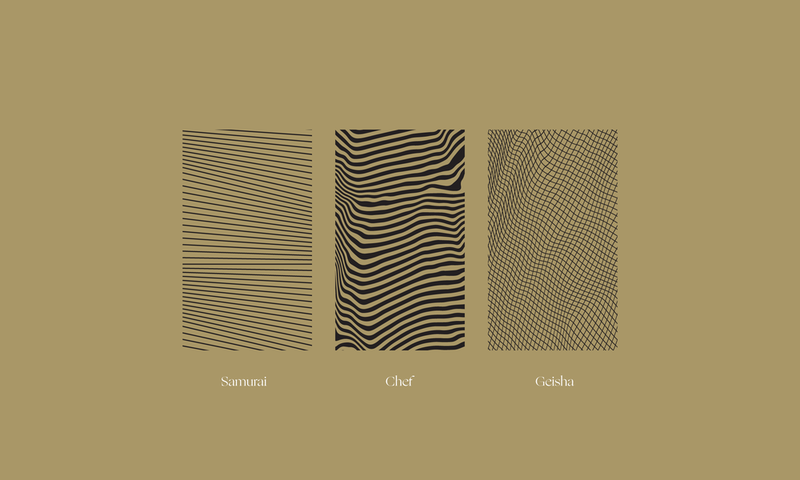 Our patterns subtly infused the Katsuya brand elements into social, print, and in-restaurant assets.